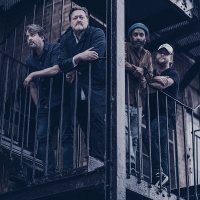 Elbow have added a Wembley Arena show to their autumn schedule with tickets for the 27th November gig going on sale at 9am on Wednesday 12th September, priced £32.50. Wembley joins Nottingham, Birmingham, Liverpool, Manchester and The O2 in Greenwich on Elbow's tour itinerary of the nation's biggest indoor venues. We have tickets for the other dates available now although Manchester is down to re-sales only. Of course, with the Olympics and Paralympics behind us and a stunning summer of sport which also served up Tour de France and US Open wins, the honey-voiced strains of the Manchester stalwarts have been heard many times in recent months. Many a broadcast closed with hastily assemble montages of glorious unexpected triumphs and, just very occasionally, heroic failures. And the scroll down the list of possible soundtracks to these new memories rarely made it past 'E', no further than Elbow's One Day Like This. But it's not just sport - Elbow have heralded a new age of ubiquity, popping up on teen telly, The One Show and Sky Arts and earning radio play everywhere - on Radio 1, Radio 2, 6 Music, XFM, Real and Smooth (those last two might be beers). After years of building up a deeply loyal and substantial fan base, Elbow finally got the credit they deserved (but that many fans feared) with 2008's Seldom Seen Kid. A bit of Manchester savvy, world weariness (they'd been going more than a decade by then) and no little humour saw Elbow conquer the world. The new album, Dead in the Boot, a collection of B-sides, was released in late August. The tour, of course, is selling quickly. Be a part of it.